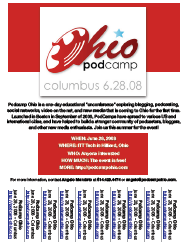 Promotional Audio and Video is now available for PodCamp Ohio. Brandice blogs individual promos as they are available for the Viral Photo and Marketing Contest. This is a GREAT video from Doctor Anonymous about Podcamp Ohio. We have another video coming soon as well! I’m loving the new promo stuff we’re getting from Podcamp enthusiasts! Be sure to add YOUR Podcamp Ohio videos (of any sort) to our Viddler group. Did you know that Angelo’s handsome pup has been sporting Podcamp Ohio gear recently? Check out the best pooch accessory ever, on Podcamp Ohio’s official mascot! Submit your pooch (or other) Podcamp Ohio photos to our Flickr group. Check out this great video from a Podcamp Ohio 2008 future attendee! We’re looking forward to seeing Mark in June, and we’re looking forward to seeing more great videos as the event nears. Want to see your Podcamp Ohio promo video on our Podcamp Ohio blog? Put the video in our Viddler group and I (Brandice) will feature it in upcoming weeks! Viral Champ of the Day: Kait! Thanks, for helping us kick off the Flickr pool, Kait. Glad to see the Podcamp Ohio gear is going to fun use!